God commanded land owners not to squeeze all they could from their property. They could not reap the corners of their fields and if something fell to the ground during harvest they could not pick it up — it was left for the poor. Boaz, a wealthy land owner, followed these commands with a generous heart even when many did not. 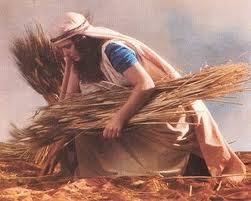 Ruth, a poor foreigner, went to the fields to gather and ended up married, becoming ancestor to Israel’s greatest king! This was God’s grace to be sure, but what if Boaz was stingy or Ruth that morning had said, “I think I’ll sleep in today.? God’s grace works hand-in-hand with our compassion and diligence. We don’t know when God’s opportunities will happen — but they happen more when we are diligent, faithful, and obedient to God’s word.